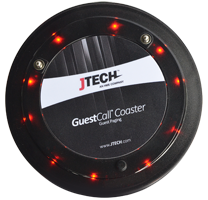 With our GuestCall® Coaster Pager, your staff can instantly notify guests with a flash, beep or vibration when their table is ready. Easily stay in contact, speed up table turns and increase revenue as guests enjoy the freedom to visit the bar or nearby areas while they wait. 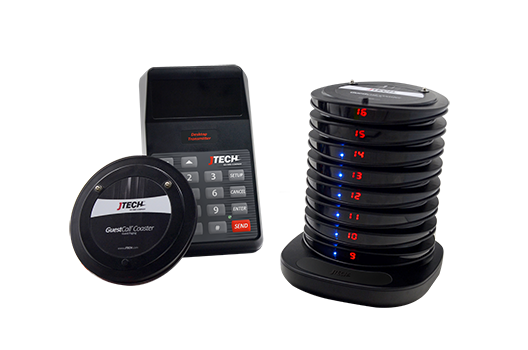 The patented GuestCall® digital coaster pager is a stackable charger that fully charges up to 15 coaster pagers in 2 hours. Unlike many coaster pagers, you can replace the battery yourself instead of sending it in. The GuestCall® Coaster pager is one of our most popular-selling guest pagers for restaurants and can be branded to promote your business. The GuestCall® Coaster Pager is extremely flexible and integrates with other paging systems and software applications. Up to 2* miles of line-of-site coverage with unique ID to prevent signal interference when used with the IStation and IQ Base transmitters. Or up to 1 mile when used with the NEO transmitter. Third-party POS and KDS system integration capability when used with the IStation and IQ Base transmitters. Managers can choose between the rechargeable numeric pager, rugged pager or alpha text pager (IStation and IQ Base transmitters only). Up to 2 miles line of site coverage with the IStation and IQ Base transmitters or up to 1 mile when used with the NEO transmitter.